Imaginators are people who use their imaginations and power of creativity to create wondrous things. They work hard on thier pony sites and don't steal others hardwork. This site is no longer on the web, but still worth supporting! Lets look forward to next years IDP August 2, 2002! I’m a proud supporter of LYLP! My Little Ponies have feelings too! Check out this guide to loving your ponies. Our world is full of different people. In the My Little Pony world, there is a lot of diversity, as well. This campaign's goal is to sway Hasbro's decision in the direction of producing a 20th Anniversary line of My Little Pony! 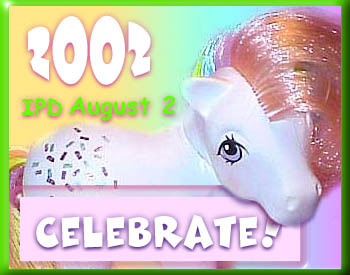 This campaign's goal is to also sway Hasbro's decision in the direction of producing a 20th Anniversary line of My Little Pony! This page is no longer on the web, It was too much for her to do by herself. Join us in praise of Big Momma Peachy, wise and benevolent protector of all that is good in Dream Valley, and ruthless avenger of those who have been wronged! Seek her mercy and wisdom, and fear her righteous justice. The Glorious Peach Mother knows all and sees all! Don't forget to collect the Playsets! Ponies are for playing with - they are toys. Stop collectors from getting gouged on eBay by buying from other collectors. If you do shop on eBay -don't overpay! T: Truth -- stating your true opinion. I'm not in any way trying to squash opinions. A: Appreciation -- keeping in mind that other people have other opinions, and appreciating and keeping an open mind toward those opinions even when you strongly disagree. C: Care -- caring enough about others to value their feelings over your emotions about a toy. T: Tact -- the actual stating of your opinion using tact. Tact is defined as "a keen sense of what to do or say (or in this case, how to say it!) in order to maintain good relations with others."